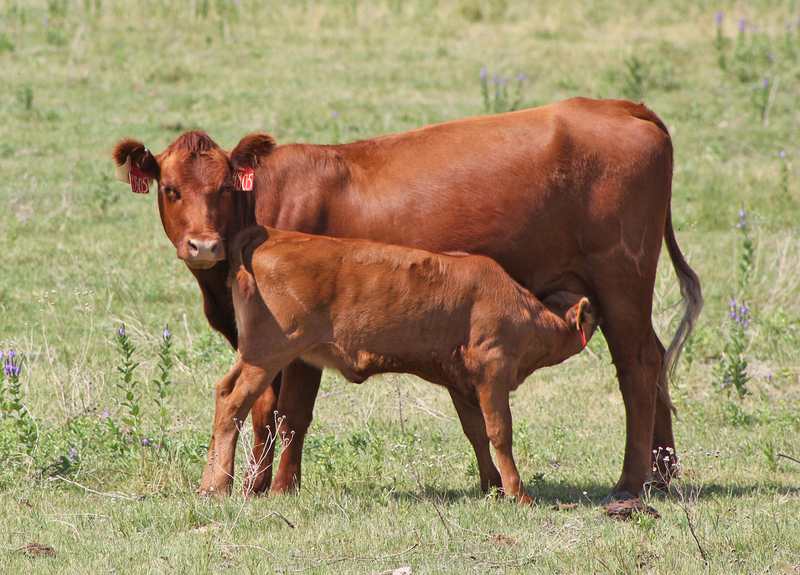 Forage quality decreases in late July and August can present challenges for the May calving heifer. Photo credit Troy Walz. Across the Great Plains the end of summer generally brings hot and dry conditions to the region. Both warm and cool season grasses begin to mature and decline in forage quality by late July and August. This decrease in diet quality can present challenges for the May calving heifer, who is still growing and nursing her first calf. The breeding season for May calving cows starts in late July and August. A combination of low quality grass and the increased nutrient demands of lactation and growth for the heifer can result in a nutrient deficiency that reduces the chances of the heifer rebreeding with her second calf. For example, the nutrient quality of late summer grass might be 9.3% crude protein and 53% total digestible nutrients (TDN) based on research in predominately warm season perennial species area. Cool season pastures would mature and decline in quality ahead of warm season pastures. Knowing the plant composition of your pastures is important and helps estimate diet quality. A 2-year old cow weighing 1000 pounds and nursing a calf is estimated by the 2016 Nutrient Requirements of Beef Cattle (2016 NRBC) to require 690 g of metabolizable protein (MP) and 13 pounds of TDN. Metabolizable protein is protein that not only meets the nitrogen needs of bacteria in the rumen but also meets the growth and lactation needs of the young cow at the tissue level as well. Assuming this lactating heifer is consuming 22 pounds of dry matter from this grass, she is only consuming 489 g MP and 11.7 pounds of TDN according to the 2016 NRBC model. Providing 2 pounds of dry matter from distillers grains to this young cow, in addition to the grass the heifer is grazing, would provide her approximately 673 g of metabolizable protein and 13.9 pounds of TDN. Meeting her growth and lactation needs puts this heifer in a much better position to rebreed with that critical second calf to keep her in the cowherd. The cost of supplementation is dependent on distance hauled and any modifications for ease of handling such as cubing or bagging. However, for comparison the assumption could be made that dried distillers grains could be purchased from the ethanol plant for $150/ton, or from a feed supplier who bagged it for ease of storage and handling for $300/ton. The assumption could also be made a producer wanted to feed lactating heifers for the first 45 days of the breeding season and supply 2.2 pounds of dried distillers each day to each heifer. Assuming $150/ton, not including feed waste or delivery to the heifer, this supplement would cost less than $7.50 per heifer for the 45 days. Assuming $300/ton, the cost would be $15 per heifer for the 45 days. Obviously, if this increased the number of heifers retained in the herd and provided more calves to sell at weaning, then it was a worthy investment. Producers interested in more help with nutritional management of the cowherd should contact University of Nebraska extension personnel.